SAN DIEGO, Calif., September 7, 2012 - Last week, Cuker had the honor of being named a two-time finalist in Web Site Excellence at the 2012 OMMA Awards. 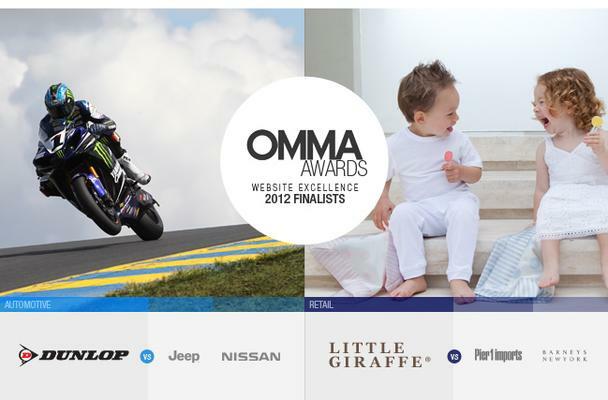 Both DunlopMotorcycle.com and LittleGiraffe.com were recognized by OMMA, the prestigious Online Media, Marketing, and Advertising awards that celebrate the year’s most innovative and brilliant online advertising creative, campaigns and Web sites. For Dunlop Tires (a Goodyear company), Cuker completed a website overhaul for Dunlop’s motorcycle tire division with a dynamic new site that visually conveys the sophistication of their tire technology. The new DunlopMotorcycle.com includes a dealer locator, photo galleries, team rider pages, and a custom interactive fitment guide that recommends tires based on a variety of features. Cuker also produced a series of technical videos to highlight the innovative technology behind Dunlop tires. The site will be competing against Jeep and Nissan for top honors in Automotive, one of the most competitive categories at the OMMA Awards. Cuker also worked with luxury children’s apparel brand Little Giraffe to grow their brand globally and take their eCommerce business to the next level. The LittleGiraffe.com site is a visually compelling brand website as well as a full-featured eCommerce store. The site includes interactive product descriptions, a store locator, blog, and a photo submission feature for customers to submit photos of their children with their favorite Little Giraffe products. Little Giraffe will be competing against Pier 1 Imports and Barneys New York for the top prize. This is the second year in a row that Cuker was selected as an OMMA finalist in Retail. In 2011, the agency was honored for Manduka.com, a branded eCommerce website for high-performance yoga brand Manduka.